Iran's advanced nuclear program may be the world's most important emerging international security challenge. 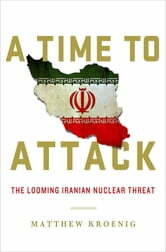 If not stopped, a nuclear-capable Iran will mean an even more crisis-prone Middle East, a potential nuclear-arms race in the region and around the world, and an increased risk of nuclear war against Israel and the United States, among many other imminent global threats. Matthew Kroenig, internationally recognized as one of the world's leading authorities on Iran's nuclear program, explains why we need to take immediate steps to a diplomatic and, if necessary, a military solution - now - before Iran makes any further nuclear advances. A Time to Attack provides an authoritative account of the history of Iran's nuclear program and the international community's attempts to stop it. Kroenig explains and assesses the options available to policymakers, and reflects on what the resolution of the Iranian nuclear challenge will mean for the future of international order. This dramatic call to action provides an insider's account of what is being said in Washington about what our next move must be as the crisis continues to develop.